In addition to our popular shows, we also offer musical lectures for organizations that require a bit more of an educational angle, such as adult study programs in cultural and educational centers. 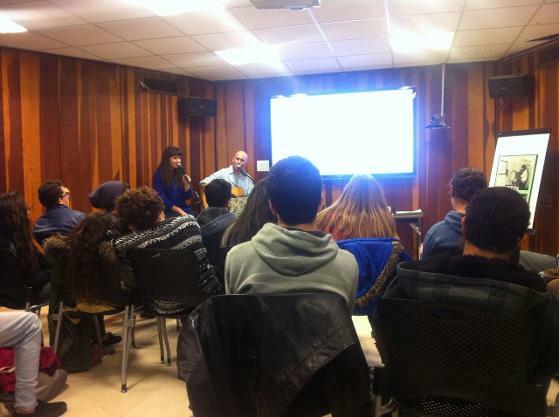 Integrating live music in lectures is a fun and interesting way to learn about different periods in the history of music. Beginning with the British Colonial period and the American War of Independence in the 18th century, the movement of settlers Westward, the Gold Rush, the wave of Irish immigration, the Civil War in the 19th century, and the civil rights movement in the 20th century, we will discuss the development of American folk music and the influence of the political and social situation on the music over the years. 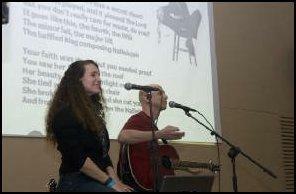 The lecture is integrated with both old and new classic folk music. The counterculture of the 60’s was a cultural phenomenon that first developed in the United States and spread to most parts of the Western world between the early 60’s and the early 70’s. This movement gained momentum during the extensive military involvement of the U.S. government in Vietnam. During the 60’s, tensions developed in American society concerning the war in Vietnam, racial relations, human sexuality, women's rights, traditional definitions of authority, experimentation with psycho-active drugs, and different interpretations of the American Dream, alongside the rise of the hippie and flower children culture. War protest songs and anti-war anthems began to emerge that were significant for the era. It was also a period of rock festivals, such as Woodstock, which played an important role in spreading the counterculture across the United States. With the songs of Pete Seeger, Bob Dylan, Joan Baez, songs from “Hair” and many more. The “British Invasion” is a term for a period in music history that began in 1964 and continued for several years, during which many British rock 'n' roll artists crossed the Atlantic and began to perform and influence the music in the United States. With familiar and well loved songs by British singers and bands: the Beatles, the Rolling Stones, Dusty Springfield, Herman’s Hermits, the Animals, the Hollies, Petula Clark, Lulu and others. The stories of the key figures and events of the U.S. Civil Rights Movement of the 1960’s told through the songs of the period. With songs by Joan Baez, Harry Belafonte, Bob Dylan, Pete Seeger, Janis Ian, Phil Ochs, and traditional spirituals.